After creating a procedure to reverse rows or columns of data, I was informed of a much simpler way to do this. If you have a list of data in multiple rows that you wish to reverse, this can be done using a reference column. In the column next to your data, insert an ascending number to identify each row. Ensure that the row that you wish to begin with has the highest number. Select the data and the reference column (cells A1 to B6). Go to the data tab in the ribbon and press SORT. The following box will be displayed. Ensure that you have selected to sort using the reference column (column B) in the order largest to smallest. The list will then be reversed. If you have a list of data in multiple columns that you wish to reverse, this can be done using a reference row. 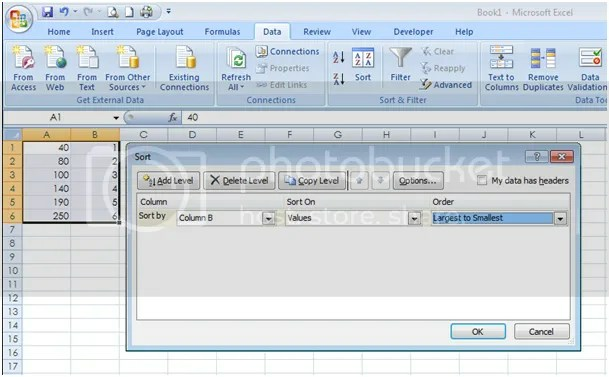 Similarly, insert values to reference your data across an empty row below or above your data. Copy this data and then use paste special and choose transpose. This will then convert your single row of data into a single column. Select the data and the reference column (cells A5 to B10). Go to the data tab in the ribbon and press SORT. Once again, sort on column B from largest to smallest. Even though the list is reversed, you now need to convert it back to a single row. This can be done using the transpose function a second time. Copy the data in cells A5 to A10 and select paste special and tick transpose. Your data will now be reversed. This is a much quicker way to reverse rows or columns. Cheers Steve! Haha, no worries. If you have any other queries, send them through!